The Vale of Clwyd in Denbighshire is a beautiful area of North Wales, lying between the border and Snowdonia. It is an excellent walking area and easily accessible. The lush green Vale, which takes its name from the river Clwyd flowing through its length, nestles between the Clwydian Hills and gently rolling hills in the west. It starts as a narrow enclosed river valley, then broadens into a fertile plain, passing the historic market towns of Denbigh, Ruthin and St Asaph to meet the coast at Rhyl. In addition to its splendid scenery, the Vale contains a wealth of ancient and medieval sites, buildings and other treasures. These include iron-age settlements, Norman castles, the smallest cathedral in England and Wales, unique churches, holy wells, and many fine houses of historical and architectural interest. 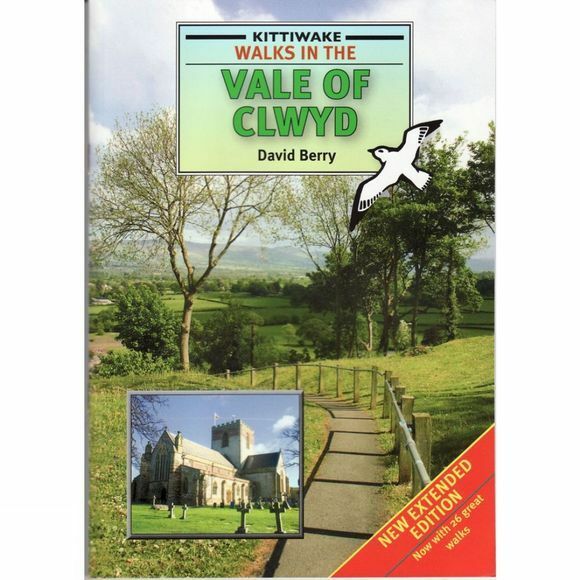 This new revised and extended edition now contains 26 great walks.